If you are looking for moolah cash, the cow on Cashmill Bingo has lots of ways to win it. The mill is churning out winners every day. Could you be the next winner? The only way to find out is register today. This is not your everyday run of the mill bingo site. This is Cashmill Bingo where money grows on trees and players are ready to claim it. The cow dressed pretty in pink for your arrival is serving up lots of games, promotions and good times. The homepage is adorable has a theme that I hard to resist. It is a far cry from the last web page that lacked luster and was not easy to navigate. While most cows produce milk, this cow left the pasture and is found a shady tree to serve up the best highlights of the site with a multitude of premium games on display. Cashmill is launched by Byworth software, a leader contender in the online bingo community. Known worldwide for outstanding bingo products, they lead the way to outstanding quality. Licensed by the Curacao Internet Gaming Association, Cashmill Bingo operates under Samtau Inc.
Get ready to play thrilling games and bingo that offers a wide variety of special games. There are two bingo variations to choose from 90 ball and 75 ball bingo. A schedule for each bingo is available offering Speed Bingo, Early Bird Nickels, Coveralls, Hang Max and much more. Progressive Jackpots are available for 90 ball and 75 ball and can be won if there is a bingo in the specified number of calls. Chat Games and Side Games are offered in each bingo room. Slot Contests offer cash prizes to the top winners featuring different slot games. The slots are pure entertainment with superb graphics and some machines offering more than one Bonus Round and Progressive Jackpots. A full range of other games are available and offer Instant Games, Pull Tabs, Video Poker, Keno and Blackjack. New players have the option to take the Deposit Bonus on their first deposit. Terms and conditions apply on all bonuses and players should read the rules before accepting them. For those who do take advantage of the bonus offer, they will have a lucrative head start on a bankroll that will allow more leverage towards winning with greater odds. Free Bingo is available to earn free cash with cards that are available at no charge. Check the schedule and don’t miss out on this offer. Weekly and holiday Tournaments offer amazing prizes as players compete against each other to place in the top winning prize pools. Exclusive promotions are also available with incentives that are tempting. The promotions are not as inspiring as other bingo sites. 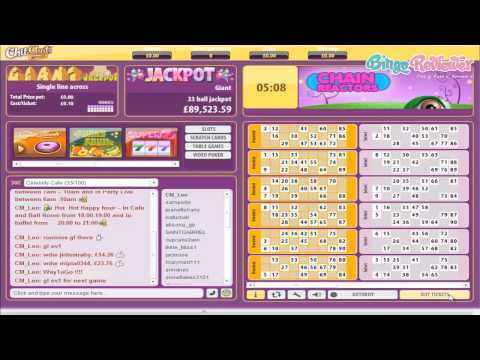 There are limitations on bingo variations where other Byworth software sites offer a complete spectrum of bingo games. We rate Cashmill Bingo with 3 Pink Hearts. This site has a really nice collection of games. You’ll find everything from bingo to keno, instant bingo, pull tabs and casino games for the ultimate experience. They also do a pretty good job of adding new games to the site which you don’t see very often. You can count on things never getting boring! I never run out of games to play here and I’m someone who like to play a variety of different games. I really enjoy playing the penny and free bingo that they offer. They give away tons of money each month, nearly $1,000,000. I’ve been playing here for a while and that’s definitely true because they give away a whole bunch of money all the time. There are progressive and multiline slots with unbelievable bonus rounds to look forward to. I would definitely recommend this site to other to try out when they get a chance. It’s worth it! What can go wrong with a site that has a really friendly cow on the front page? Well, it looks a bit funny for a start, but I don't really care as long as they have some good bingo around. Cashmill has only 75 and 90 ball rooms (which are the most popular games anyway), but recently has added the very popular 30 ball bingo, and that is the winning combination for me. I saw they have an impressive number of rooms, from free rooms and those with tickets costing only a penny, to the quarter dollar tickets. Really nice selection and good games, that made me forget how much I hate to download and install the casino software. They don't allow US players to register and play, but that is something I am accustomed to. The starting bonuses are not that huge, but apart from that, really very little to complain. I was very impressed with their huge selection of games! I found it very easy to register and I was off and playing in no time at all. The only thing I was not overly happy about were the bingo variations. They only offer 75 and 90 ball. I like to have lots of options, especially when it comes to playing my favorite game. However, here I was only given the basic options. Aside from this, I was very happy with the site. I also like to play slots and because there was not a big selection of bingo, I decided to brows their slot options. They have a huge selection to choose from. They have a number of progressive and multiline slots, equipped with incredible bonus rounds and plenty of chances to win big! They also offer free and penny bingo which is always a plus. Quarter bingo cards are a nice addition as well.